Brandon bed and breakfast travel guide for romantic, historic and adventure b&b's. 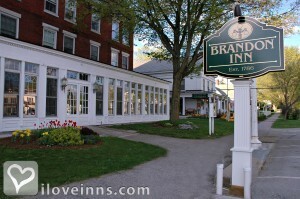 Browse through the iLoveInns.com database of Brandon, Vermont bed and breakfasts and country inns to find detailed listings that include room rates, special deals and area activities. You can click on the 'check rates and availability' button to contact the innkeeper. Brandon bed and breakfast innkeepers are proud that their town is known as Vermont's "hidden jewel". Nestled on the western slope of the Green Mountains, with open farmland stretching west towards Lake Champlain, Brandon boasts two village greens flanking the falls of the Neshobe River. Brandon bed and breakfasts are located in some of the almost 250 buildings on the National Historic Register. Brandon offers a vibrant downtown with antique shops, art galleries, eateries, a bookstore, and gift boutiques. Brandon is home to folk artist Warren Kimble, and has the biggest Independence Day parade in the state. Brandon bed and breakfast guests allmost all visit the covered bridge, and the hundred-foot tiered waterfall near pristine Silver Lake. Brandon, Vermont, an unspoiled village in the authentic Currier & Ives tradition, has been tastefully updated to suit the needs of today's visitor. Visit Brandon for the newly opened birthplace of Stephen A. Douglas and home of the Brandon Museum, some of Vermont's best recreation: skiing (both cross-country and downhill are nearby), hiking, mountain biking and snowshoeing in the Moosalamoo National Recreation Area and ice fishing on Lake Dunmore.Brandon, Vermont is also know for his many artists and Vermont's Governor has declared has been Brandon By Lilac Inn.